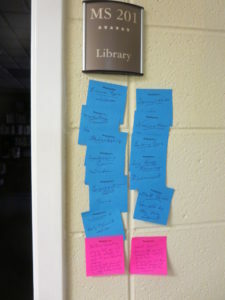 A good way to pray for your church ministries and building is to do a prayer walk where you post sticky notes letting others know they have been covered in prayer. We developed this posted prayer notes prayer walk as part of our church building campaign and it can be used for any church prayer objective such as praying for revival, praying for vision, direction, encouragement, church ministry and mission. 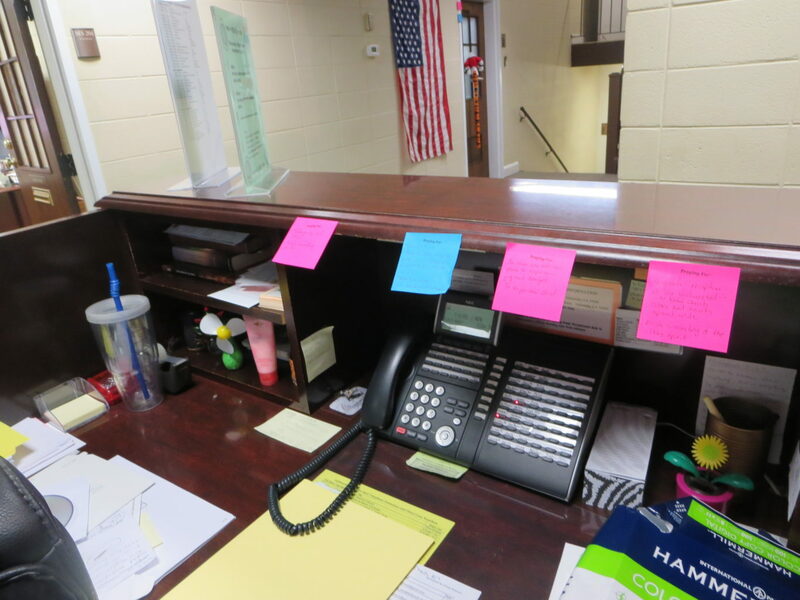 We gave out blueprints of the church building and provided volunteer intercessors with sticky notes where they wrote a few words of prayer and placed them on the door frames of all classrooms, worship areas and staff offices in our church. Here are the secrets of doing an effective church prayer walk using sticky note prayers. A prayer walk was one of the ideas on a list of ideas given to our prayer coordinator by the building campaign committee. The prayer coordinator asked me to lead the event. Organizing and putting on a posted note prayer walk event is fairly easy for one or two people to plan and prepare. In our case the prayer committee worked as our core group of participants and our church communications staff supported us with the necessary publicity to let the church know about the event. My job as the leader mainly consisted of preparing materials and instructing participants what to do on the evening of our prayer walk. 2. Educate others about prayer walking. Our church had never done an organized prayer walk event. I was asked to give a short talk to the prayer committee about what prayer walking is and how ours would be done. The chairman asked me to cover some of the Biblical ideas behind prayer walking, what other churches had done and what we hoped to achieve through our prayer walk. To tell about what prayer walking is, I used ideas from a book called Prayer-walking: Praying on Site with Insight , by Steve Hawthorne and Graham Kendrick. The purpose of prayer walking is to receive God’s power for both those we’re praying for and also for those who are walking and praying. In particular, being onsite helps us become more aware of our surroundings and opens our eye to new ways to pray as the Holy Spirit gives us insight. On our church prayer walk, our focus was on God’s Kingdom work and his blessings, direction and protection. 3. Set a date and time when few church meetings are scheduled. Since we wanted to have all of the rooms and offices in the church open so those praying could go into the rooms to gain insight into how to pray for the groups and staff who use the rooms, we scheduled it on an evening when few church groups meet. That way it was quieter for prayer and we had greater access to all parts of the church building and grounds. Thursday night turned out to be a time when the least meetings go on in our church. We set the time from 7 – 8:30 PM. We decided to have everyone to gather in the sanctuary to receive their assignments, materials and instructions and also to have a group prayer before moving out into the church hallways and other buildings. 4. Create and duplicate a list of all of the groups or church staff who use every room or space in the church. I made an appointment with our church staff member who is responsible for making room assignments based on the church schedule. She created a spreadsheet for us listing as many groups who meet throughout the month as possible. Because our church has over 82 rooms and offices, it was a 3 page list! Once we made the list we had around 230 different Sunday school classes, preschool day school classes, staff offices, committee meetings and community groups listed for whom to pray! I discovered that our church has a number of ministries and work areas that don’t have a designated space in our church, such as the church historian and wedding coordinator. Also, some groups such as women’s circles meet off site in homes. We covered these additional groups and ministries by assigning a prayer walker the letterboxes in the hallway where these groups receive their mail. Instead of posting their prayer note on a doorway, we put it into their mailbox. 5. Prepare sticky notes with the words “praying for” on them. We purchased a bulk package of sticky notes. I went online to order an inked stamp that said “Praying for.” You can also order pre –printed sticky notes with “praying for” printed on them online. 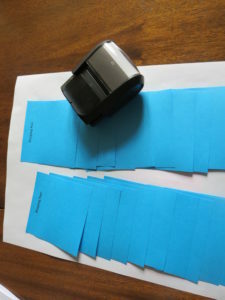 Another idea is to create labels on your computer using printer name badge paper with adhesive on the back or large address label size stickers. Print these off with the small words “Praying for” on each sticker using printing templates found online for the product you are using. 6. 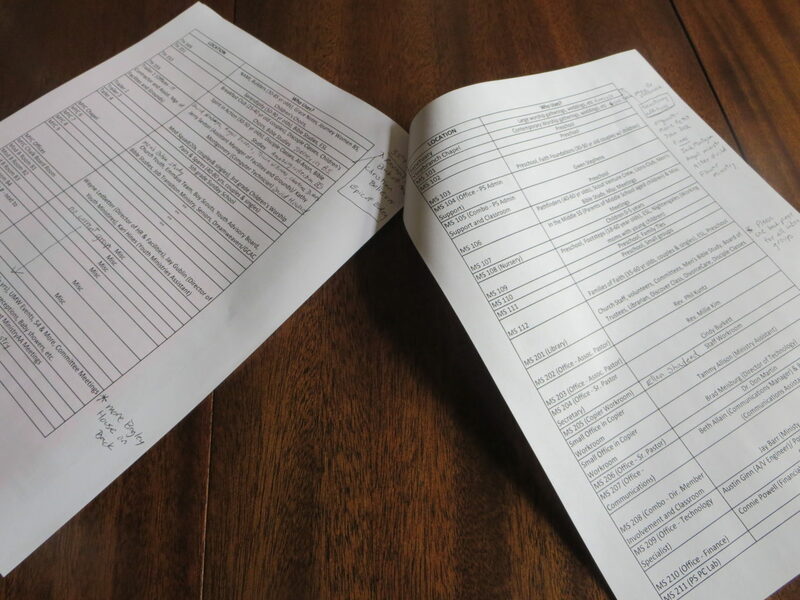 Duplicate copies of the church floor plan and highlight different hallways and rooms for each assignment packet. The church staff provided me with small floor plan sheets for each floor and building on our church property. I photo copied several copies of each of these. Then I took a yellow highlighter marker and circled groups of rooms for each participant to cover as their assignment. One important factor that I took into consideration in deciding how many rooms to assign was to look at how many different groups met in the rooms in this grouping. For instance, a number of the rooms where the preschool day program met were only used for a single preschool class and maybe one children’s Sunday school class. So I circled 5-10 classrooms of this type for a specific prayer assignment. However we discovered that the church library was the most popular meeting spot in the whole church building because it had a large conference table, good AV equipment and comfortable chairs. We counted at least 20 different groups that met here, including the weekly staff meeting, divorce care and the finance committee. I decided to assign this single room to a prayer walk volunteer as their whole “territory” to pray over. I estimated the minimum number of participants I thought might come to the prayer walk and made sure that I made this number of specific assignments to cover the whole church. In my case, I decided to make 15 specific assignments. Because I expected there to be more attendees than this minimum number, I created another type of assignment sheet that didn’t have a church floor plan on it but rather said: “Assignment: Pray where the Spirit leads.” These prayer walkers were instructed to pray in an area of the church where they felt drawn to pray, whether it be in an area where they had a personal knowledge of the ministry such as in the youth center or an area of the church they seldom went but wanted to become more familiar. 7. Assemble the assignment packets. Each assignment packet included the complete list of all of the rooms and buildings in the church and what groups or staff members used these rooms. I then stapled the assignment sheets on top, whether it was a floor plan of the church or a page that said to pray where the Spirit leads. For efficiency, I decided to stamp the sticky notes while I was putting them onto each packet. I made an assembly line where I would put a row of sticky notes along the backs of 6 or 7 packets at a time, stamp them all with “praying for” then put another sticky note on top of it in a tiered row. I put 20 sticky notes onto each packet. 8. Get the word out about the prayer event. Since our prayer walk was part of a larger church building campaign, it was listed as part of the series of events in all of the announcements. Special specific announcements were also included in our church bulletin and email newsletter. In addition, an email notice was sent out to our church prayer chain and a printed announcement was placed in all of the adult Sunday school boxes. Please join us to cover in prayer the many ministries and outreaches that use our church facilities as we plan our new building program. Meet at 7:00 in the Sanctuary to receive your instructions. You will be given a list of all of the classes, ministries, community outreach programs and staff members who use each space. You will be assigned a hallway or area to make sure that we cover the whole church. You can go as an individual or with a partner. You will pray at each doorway. 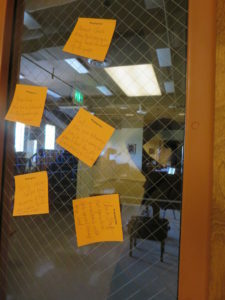 You will then use post it notes that we provide to tell the group, person or ministry that they have been covered in prayer and also to write down a few words telling what you prayed. You do not need to pray out loud with others to do the prayer walk. All ages are welcome. 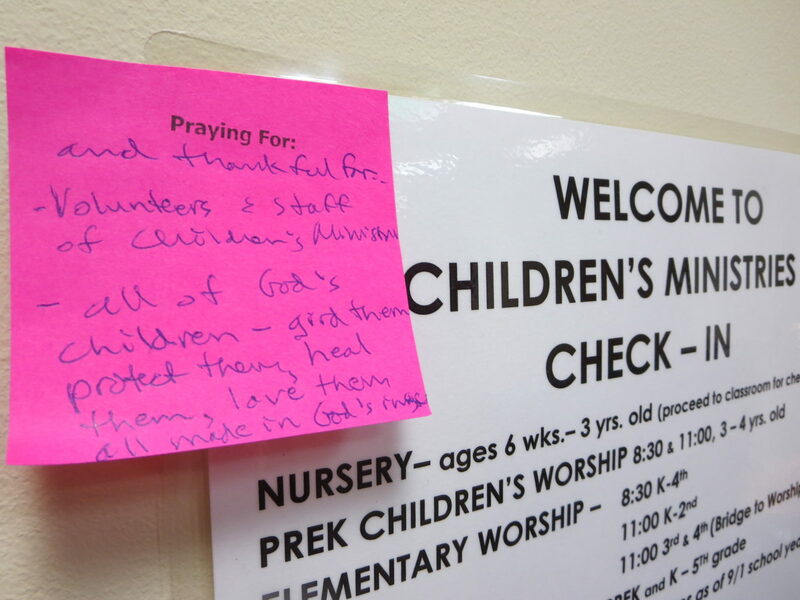 Parents may bring their children to pray with them if the children are old enough to pray or write the notes. You are free to leave when you have finished praying. 9. Arrange with the custodial staff to have as many classrooms and offices unlocked as possible. Our church locks rooms around the church when they’re not in use. 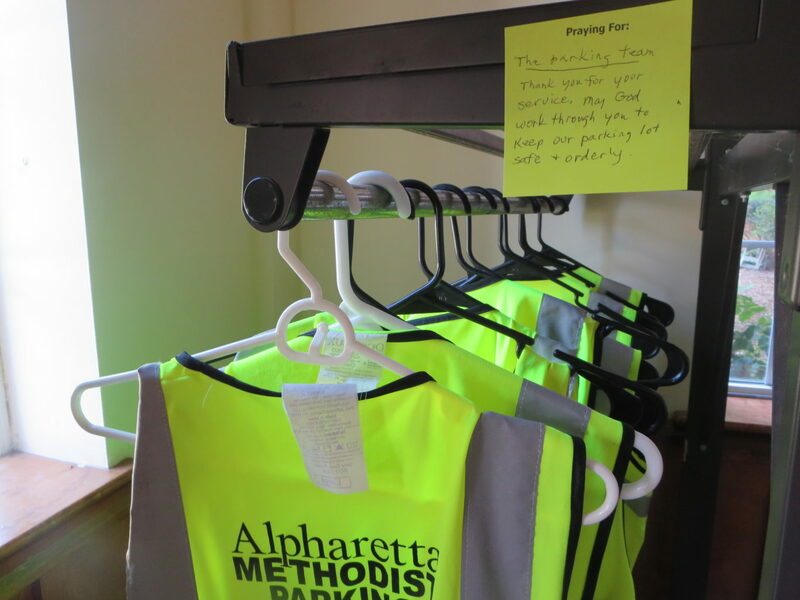 We put in a request prior to the prayer walk that as many rooms as possible be unlocked so the prayer walk participants could go into the rooms to gain insight into the groups for whom they were praying. 10. Prepare a prayerful meeting place and greet participants. Because there were very specific instructions on how to do our prayer walk, I wanted to wait until everyone had gathered to begin telling the group what to do. To add extra prayer time into the session, I gave participants their assignment packets as they arrived at the door and then asked them to sit prayerfully until we had finished gathering. I brought a CD player with instrumental hymns that I used as meditative music and I also placed a large picture of Christ in the altar area as a focus of mediation. I passed out ink pens with the packets to those who needed them. As I passed out assignment sheets I asked if participants wanted to prayer alone or with a partner. I made an effort to give assignments with practicality in mind. For instance, I assigned several small houses on the church property to two people who were praying together instead of a single individual in the interest of safety. I also asked everyone who came to sign in with their email address when they entered. I later used this list of emails to send a follow up email after the prayer walk to receive feedback from those who participated. 11. Open with prayer and give instructions to the prayer walkers. Here are sample instructions that I gave. They can be modified to suit your unique situation. Two types of handouts. You only need one or the other. You do not need both. They contain similar information. 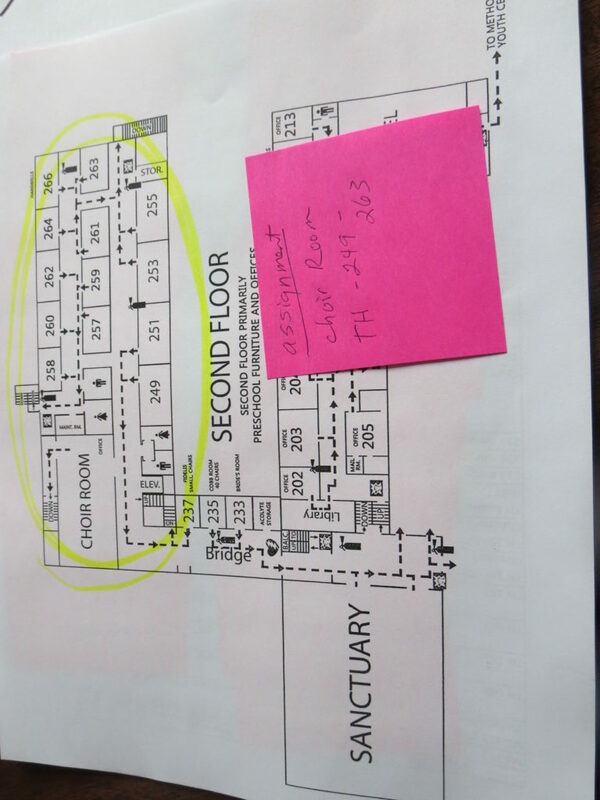 Type 1: handout with a floor plan of the church on the front page. Raise hands if you have this type of handout. Specific assignments given to a few people to make sure that we cover all parts of the church. Type 2: handout with a row of post-it notes on the front page. Raise your hand if you have this type of handout. Choose your own areas for prayer. If you received one of these handouts, pray where ever you feel led. Suggestions (1) Go to an area where you are familiar with the ministries so you can cover more than are mentioned and pray about the needs of the groups and staff members that you are aware of. (2) walk through the halls until something impresses you to stop and pray (3) Explore an area of the church where you don’t go often. Post it notes that say “Praying for.” Each packet contains 20. They are located on the back of the floorplan on the Specific Assignment handouts. They are located on the front of the packets for those with handouts to choose your own area of prayer. The colors have no significance. They just look pretty! Floor Plans of the church. These appear only on the specific assignment hand outs. They will tell you a specific area in the church to cover. Chart that lists all rooms and areas of the church and which ministries, staff and community groups use these spaces. Who: You may pray by yourself or with a partner. What: You will be praying for the group or staff member who uses the room where you’re praying. The content of your prayers is up to you. We will all begin at the same time when the instructional meeting is dismissed. You may leave whenever you have finished praying. We will not gather together again at the end of the prayer walk time. If you do leave before others, please be sure not to begin chatting and disturb those who are still praying. Pray anywhere in the church building or on the grounds. Those with assignments to cover specific areas please cover these before moving on to other areas. Feel free to explore areas of the church. Don’t forget about the youth center building. To cover our church with prayer especially during our capital campaign that the ministries that go on here will be blessed by God and bring many into deeper faith in Chris. You may pray silently or out loud. Pray in whatever way is suited to your style. Practice quietness and respect. There are several meetings going on in various rooms in the church. Please do not disturb these meetings by peeking in the windows etc, especially if it is a support group where members remain anonymous. 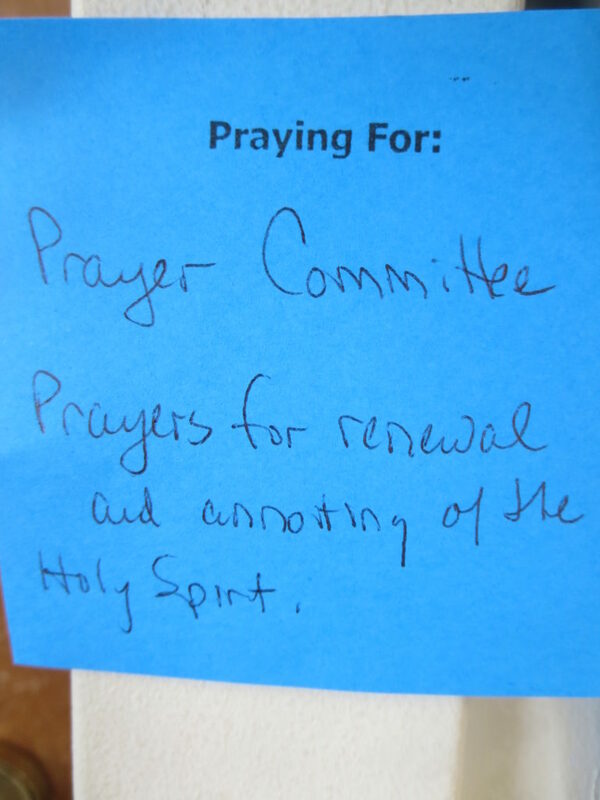 You can still pray outside the room and post your prayer discreetly on the doorframe. Some rooms or hallways may be locked. If they are, post your prayer note as close to the room as possible. Gain insight. When you arrive at a room, refer to the master list to see what groups meet there. Pay attention to the room location, anything that might be on the walls etc. that tells you something about the group. Pray onsite. Pray for the group using the information that you have or any information that the Holy Spirit might revel. Post a prayer within eyesight of those you have prayed for. After praying for a group, take one of your post it notes. Where it says “Praying for” write down the name of the group or the staff member. In the blank space, write a few words of prayer that summarize what you prayed for them. Post the note on the hallway doorframe of the room. We want those who enter to know that someone has prayed for them. If you run out of post it notes, return to the Sanctuary to get more. 12. Pray a “sending forth” prayer. After giving the instructions, I prayed a “sending forth” prayer over the group. 13. During the Prayer walk, move around the building to see how the prayer walkers are doing and offer any help needed. Since I didn’t have a specific prayer walk assignment, I looked for opportunities to pray for groups not on the list. For instance no one had been assigned the elevator, so I prayed for those with physical challenges and posted a note there. There were also shelve where mission items are dropped off, so I prayed at each bin and shelf representing such projects as the “buddy bags” ministry made for children in crisis situations. On the third floor I discovered that I had underestimated the number of groups that met in the classrooms up there. The volunteer who had been assigned this area was working diligently to make progress, so I helped out by stepping in and praying for one of the rooms that was the meeting place of 7 different groups. 14. After the prayer walk, email the participants summarizing the event and asking for comments and observations. I wanted to let you know how much we appreciated your participation on the prayer walk at church last night. Many of you had big assignments praying for all of the activities and staff members in the spaces in your assigned areas. Thank you for being conduits of God’s blessings and help for our church and for all of those groups and individuals who are the recipients of your prayers. I would like to ask a further favor of you following this event – I’d love your feedback. I think that often intercessors are overlooked as means of useful feedback to the church and staff. If you could take a moment to reply to this email I’d be most appreciative. Answer any/all of the questions below you’d like or give any sort of ideas or feedback you have. 1. What did you learn or sense about our church during your time of prayer that you would like to pass along to the prayer committee, staff or another interested party? Please feel free to share any Scriptures that came to you, insights, questions, thoughts, visions, directions etc. 2. What do you feel that you personally gained from this prayer experience? 3. Do you have any thoughts or ideas that would help us improve the prayer walk format in the future? Again, our heartfelt thanks to all of you for doing this important work in God’s Kingdom. 15. Evaluate and use the insights given by the prayer walk participants. I gained a better appreciation of the events, staff and volunteers that it takes to lead God’s work and to provide a place to worship and commune with Christians. I enjoyed going into the rooms to pray. We found info in the classrooms that helped us. Also found a roster to pray by name. Personally, I thanked God for my opportunities provided by the PLACE in which we worship and meet for spiritual and fellowship. I know I feel this way because I know our facilities are so full of the Holy Spirit. As I entered the classrooms to pray, I was overwhelmed with a sense of excitement and encouragement for our children and families. I could feel the love and hope being poured into our little ones in our church. I prayed that The Holy Spirit would protect and guide their parents I also felt a deep need to pray for these families that they will put a high priority on their faith and their children’s love for Jesus, that the things of this world will not woo them away. In some of the areas (Library and Sanctuary) I felt a real need for prayer, others there was a sense of joy. The biggest dissatisfaction expressed by those who participated on the prayer walk was that more people had not participated. Nearly everyone said they were blessed by taking part and said that they would like to see more prayer walks like this in the future. 16. Find ways of getting feedback from those who received prayer. 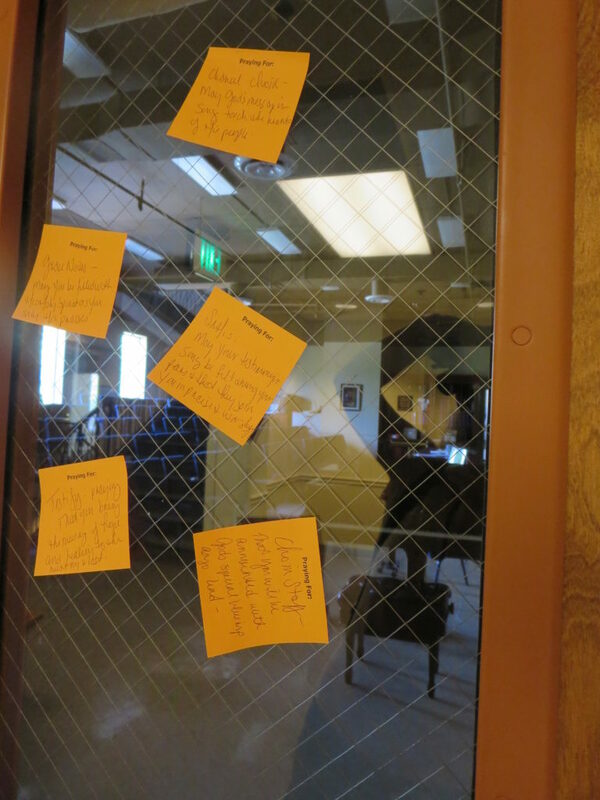 We found that one of the best ways to receive feedback on what the prayer walk sticky notes meant to our church was to ask staff members and other church groups to share their reactions to the reminders that they had been prayed for. Those in the church commented that it was wonderful to come in and see that others had been praying for them. 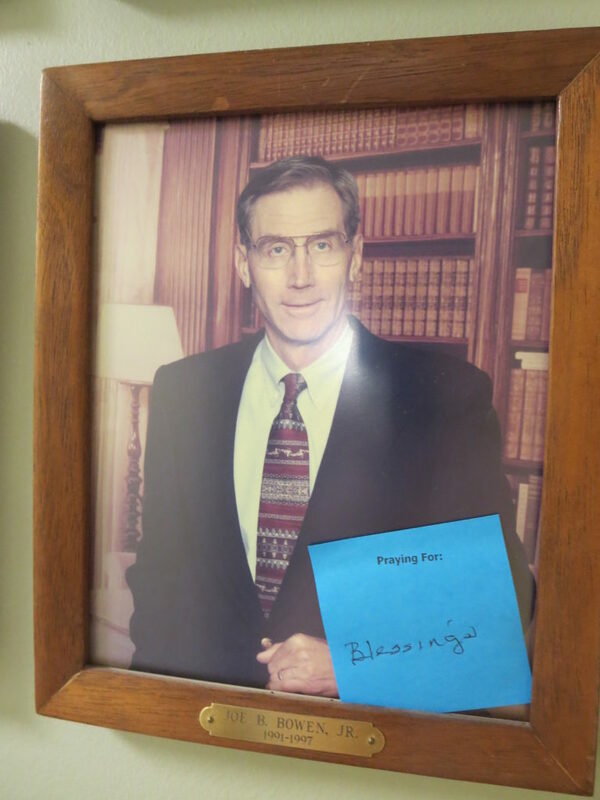 A staff member said that every time she walked into her office she was reminded that someone was praying for her. Another person commented that it felt like it gave a more peaceful feeling to their space. 17. Enable others to join in later with modified versions of the prayer walk. 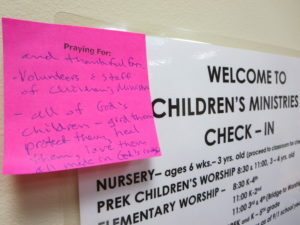 Seeing the prayer notes prompted one adult Sunday school class in our church to decide to do a modified version of the prayer walk on Sunday morning. Since all of the rooms were in use , the class members prayed silently in their classroom for their assigned rooms, wrote the sticky notes prayers in the class and then after the class was over they took their notes to post on the appropriate doorways.